This simple mantel decor for spring uses soft colors and florals to brighten up your decor. A few simple touches can transform a neutral mantel into a spring centerpiece for the home. 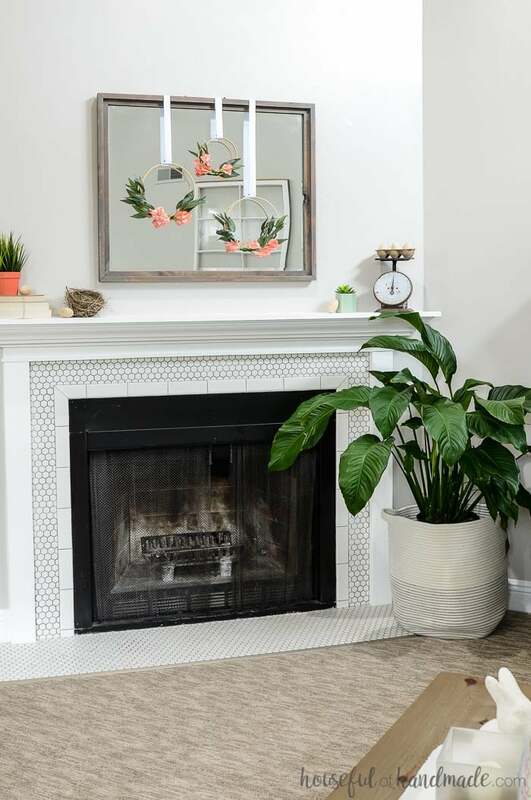 Get ready for warmer weather with this simple mantel decor for spring. 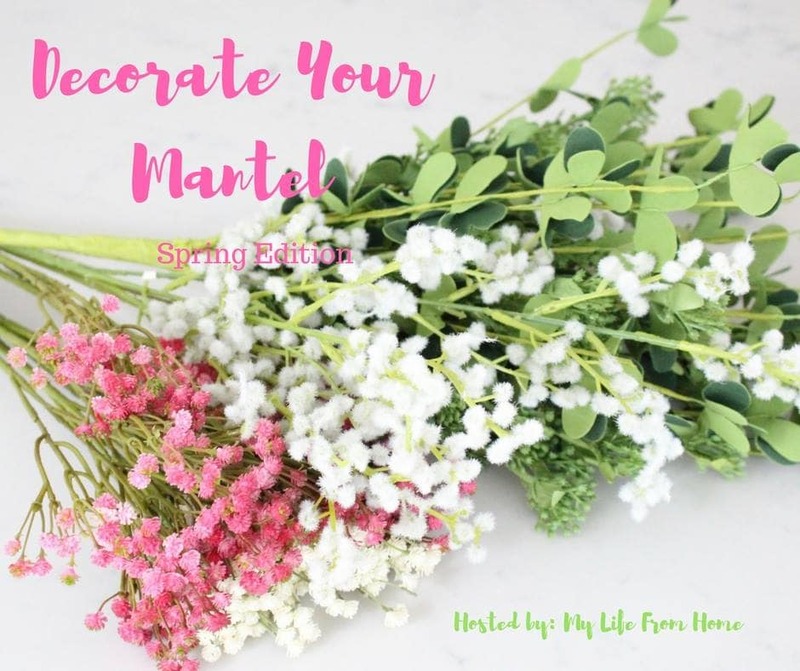 I am excited to share our easy spring fireplace decor as part of the Decorate your Mantel Spring edition. Even if spring has not come to your town, you can bring a little spring inside with these easy decorating tips. And there is lots of beautiful spring decorating inspiration with all the other spring mantels shared at the bottom of the post. I am not going to lie, I had a really hard time figuring out my mantel decor for spring. Maybe it’s because it is cold and snowy right now and I just want to curl up in a warm blanket and bing watch something. Maybe it’s because I have been spending all my time planning out kitchen remodel for next month and really just want to take a hammer to the wall already. Maybe it’s because daylight savings has done a number on me this week and I really need a nap! Whatever it is, I decided I would focus on a simple mantel for spring, but it totally worked in my favor. Sometimes overthinking your decor can cause you to overdecorate. I kept trying to throw more at the mantel, but nothing was working. So instead, I simplified. Instead of adding things to make it work, I took things away. 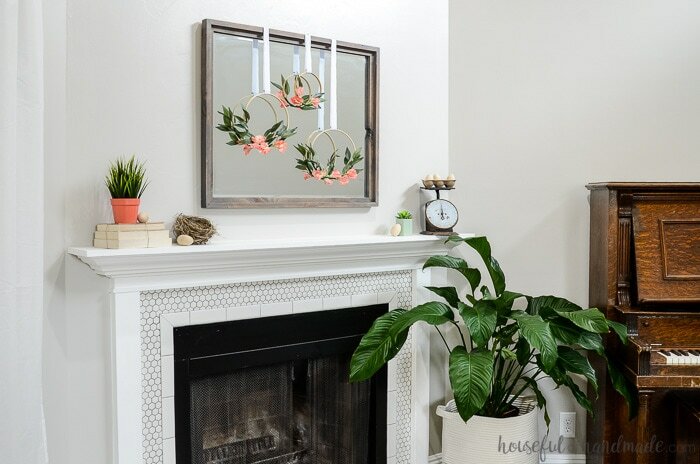 Now our simple spring mantel is perfect. I love to be more minimalist in our decor. The empty space feels so clean to me. And spring is all about clean. A new start! And that is just what our beautiful (but simple) spring mantel decor is. I knew I wanted to add some color to the mantel. I love neutrals for our winter mantel, but I was desperately missing my pop of color. Of course, the easiest place to get color for spring is with flowers! Using some faux flowers I had on hand from last year, I created three simple embroidery hoops wreaths. I used floral tape to attach the flowers to the embroidery hoops so nothing is permanent. I can pull off these flowers and change things up whenever I want. 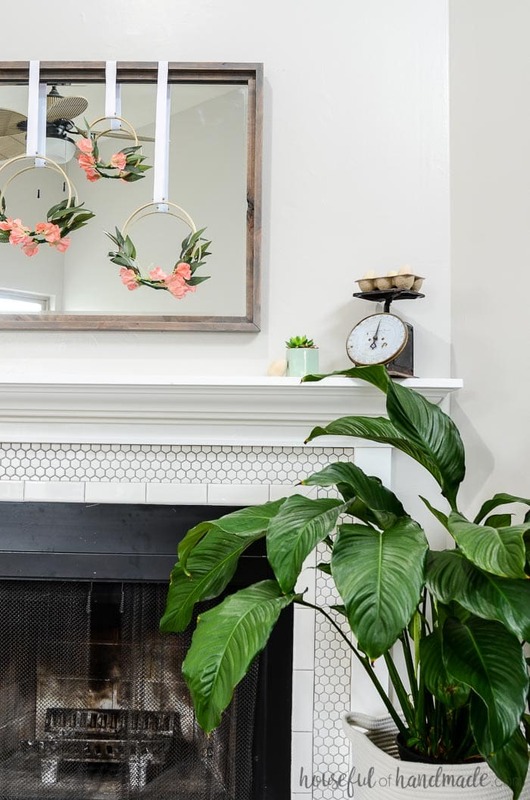 Instead of removing the large gray rustic mirror from over our fireplace mantel, I decided to just brighten it up by hanging the floral embroidery hoop wreaths over it. It adds even more color by reflecting the wreaths back. And means I do not need to worry about storing the mirror until I am ready to use it again (I really hate storing large decor pieces, but I know I do not want to get rid of this beautiful mirror). Then I added a bit of spring to the mantel with some faux grass in a colorful pot (thanks to the miracle of spray paint), a faux succulent (fake plants is the only way they stay alive at my house), and a sweet little birds nest. The birds nest was a gift from my mom when she was cleaning up some trees. This nest was abandoned and instead of trashing it, she preserved it for me. The sweet little nest is the perfect mantel decor for spring. I felt like I needed a bit more spring on my mantel. It was feeling a little blah! I tried so many different decor pieces, but they made things looked forced and cluttered. Then I remembered these wooden eggs I bought in the Target Dollar Spot. I had plans to turn them into Easter eggs for decor, but with Easter just a couple weeks away, I am pretty sure it will not happen. 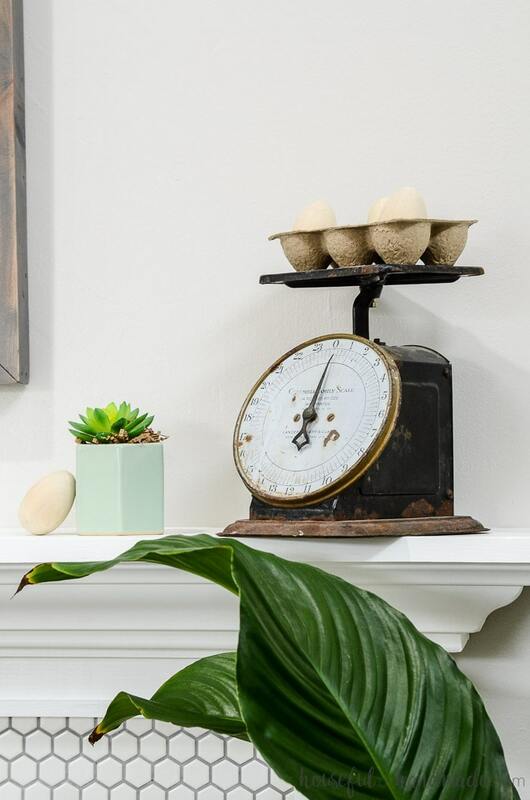 Instead, I sprinkled the eggs around the mantel and placed the half empty cardboard carton on top of the vintage kitchen scale. Those little touches were exactly what I needed tony mantel into a beautiful, but simple, mantel for spring. And for more mantel decor for spring, make sure to check out the other posts below. I love your simple decor! It’s so classy and cheery and lets that gorgeous tile shine! Those hoop wreaths super pretty! Ahhhh! It’s so cute! I love all the elements especially the embroidery hoops. Isn’t the Dollar Spot perfect for finding little treasures? Hopefully spring weather will actually come now! I probably spend way too much money at the Dollar Spot! It really is perfect for little treasure (and kid prizes). I love the embroidery hoop wreaths and they look so great on the mirror. The birds nest is just perfect! That vintage scale is amazing! Thanks so much Michelle! I am so happy with how it came together. love the pops of greenery! it really feels like spring! Now if only it would feel like spring outside too! Thanks Bre! They are so easy too. 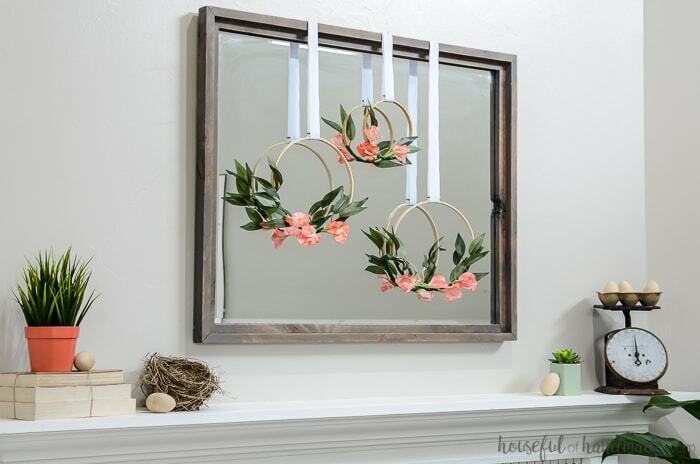 I love those mini hoop wreaths – they’re perfect for spring! And that scale is too cute! Thanks Meg! The flowers make it looks so bright and cheery. What a gorgeous mantel, Kati! I totally hear you about storing large decor pieces. Glad you can just make a little embellishment to change up the look. The mini hoop wreaths are so pretty. I have a weakness for those as I’ve been doing several projects lately with them :). Happy Spring and enjoy! Glad to know I am not the only one who hates storing them 😉 Thanks Tee! Hey Kati – your mantel is a perfect nod to Spring. 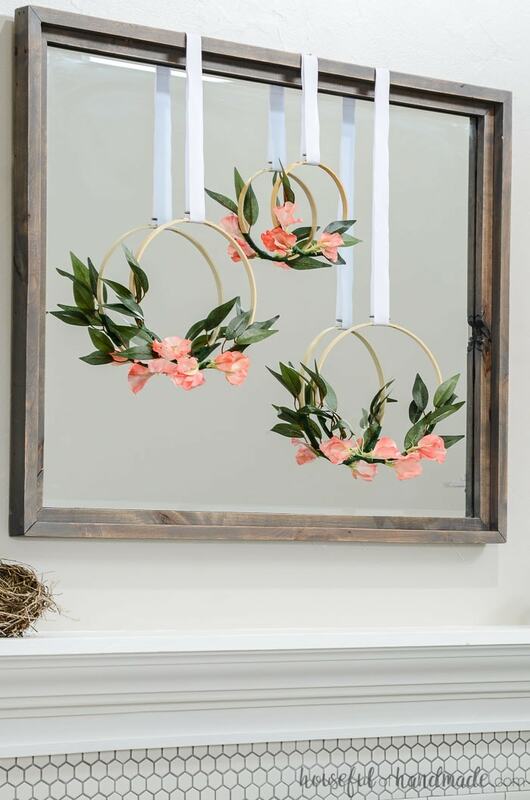 We love those sweet mini hoop wreaths with the coral flowers. So cute and clever to add to the mirror. 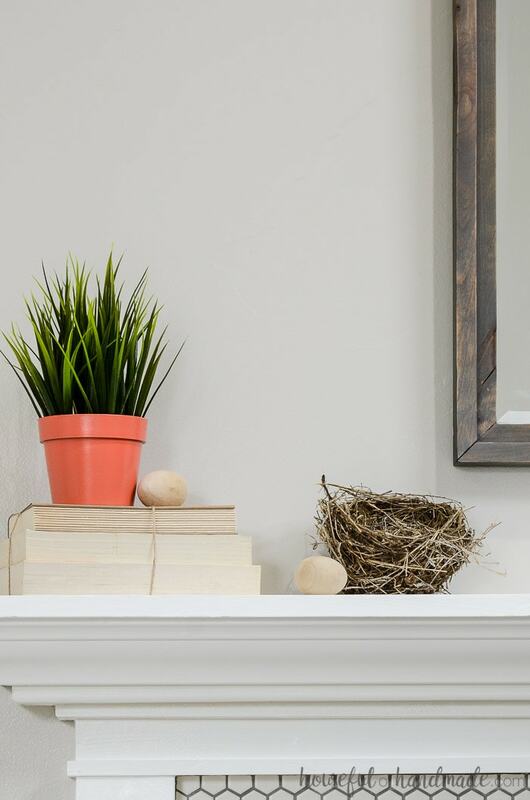 Your mom was great to give you the nest too – we love the added bits of decor from nature. Happy Spring, friend. Hopefully your weather will warm up soon! Thanks Vicki & Jenn! I love how it all came together and fingers crossed for spring to finally come!